That video of pro skier Jeff Leger sending an interplanetary front flip into one of the world’s most iconic couloirs went mega-viral as mind-blowing clips from the event drew millions of impressions across the internet and caught the attention of plenty of people from outside the action sports realm. It was unlike anything anyone had ever seen from a ski or snowboard contest–the sheer magnitude of how heavy the athletes were sending was unparalleled–but what was amazing about those clips was just how many different variables had to go exactly right for the event to even take place, and how much of a longshot it was from the beginning. The process for McMillan to get to that point was one that had started years prior with an idea formed–as many pipe dreams are–over late-night beers. “I competed on the Freeride World Tour for 10 years, and they always wondered where they could hold an event in Jackson Hole,” McMillan said. “So one night back in 2016, Eric (Seymour) and I were sitting at home, having a beer, brainstorming and were like, ‘You know where would be the sickest place for a competition? Corbet’s.’” Eric is McMillan’s husband and Jackson Hole’s content and media manager. But there’s so far to go between creating a catchy event name and execution, particularly when trying to get permits and attract sponsors to a competition that–by design–invites athletes to launch off a cliff into a 40-degree chute. Then Seymour and McMillan started going through the dual process of gaining permits from the Forest Service (Jackson Hole operates on a Forest Service lease) while also picking the right corporate sponsors to help support it. But given how hard athletes would be going and that there wasn’t a similar contest out there for comparison, the hurdles were larger. Because Corbet’s Couloir is an inbounds run, the permitting process with the Forest Service only took the resort a week. Finding the right sponsors, and actually getting them to buy-in was a different animal. Adding to that potential instability from sponsors was the fact that, ultimately, there was no guarantee the event would even run–McMillan and Seymour were only going to greenlight it if conditions were absolutely perfect. They wanted the competition to be more like a film shoot than a traditional contest, and if the conditions weren’t right it wasn’t going to happen. “Nope,” McMillan replied when asked if there was a backup plan if conditions were poor. That weather window was smaller than expected–forcing the organizers to limit each competitor to only two runs instead of three–but the Jackson Hole team had lucked out with blue skies and a foot of fresh snow. There was only one minor detail left: The athletes still had to push the envelope. If nobody was sending 100-foot, laid-out front flips and stylish 360s into the couloir would the general public even care? Luckily for McMillan and her crew, competitors went huge. And the results went mega-viral. Photo: Amy Jimmerson/JHMR. The cards lined up for McMillan, Seymour, and the rest of the JHMR crew last year, and instead of being a flash-in-the-pan, the event turned into a wild success, so much so that McMillan says she hasn’t needed to approach sponsors because, “everyone wants to be a part of it this year.” That increased attention has brought with it the possibility of larger media partners and content delivery options–the team says they’re mulling over live-streaming it globally–and has helped attract even larger names to the event (McMillan says Travis Rice and Olympian Aaron Blunck will be participating this year). 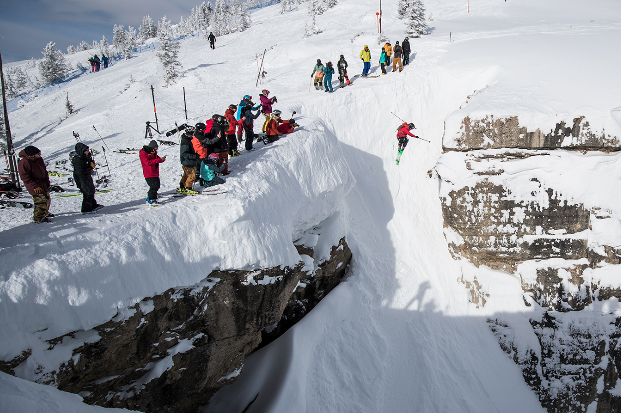 The prize money has gone up, and the crew is aiming to have an equal amount of male and female participants as more eyes will be turned to Jackson Hole. But the wild reality is that if not for a two-hour weather window on a February morning last year, none of this would be happening. The event window for Kings of Queens of Corbet’s is February 10-16.